This is a live-blog report of events in Iran on February 20, 2011 (1 Esfand). The majority of the reports in this blog are sourced via social media. With regards to the videos and images in this live-blog, we are not affiliated with the people or groups that produced them. In order to follow this report in chronological order, it must be read from the bottom up. The newest entries will be at the top. It is safe to say that today, people in Iran once again showed tremendous bravery by being out in the streets to have their voices heard. It is also clear that Ahmadinejad is no longer the story. In fact, I don’t actually recall seeing any videos with anyone chanting against him. What we have definitely seen is people asking for a wholesale change in the regime — with chants of “Death to Khemenei” and “Independence! Freedom! Iranian Republic!”. It would appear that the people have moved in front of the leaders of the opposition Green Movement–virtually all of which are either in jail or under house arrest. The regime has no qualms with beating, arresting, and torturing people. We know this. They also have no qualms killing people. It would appear that the regime is playing a game of attrition with the protesters. They are killing people, but doing so with “caution” if such a word can be used when it comes to wholesale slaughter of innocent people. But they are trying to get away with it away from the cameras. They are employing a strategy of Internet and media blackouts, combined with thugs in the streets in huge numbers to keep the word from getting out and being covered by the media and to intimidate people with the hope that they will eventually go back home. This is a strategy that they were able to employ somewhat successfully in 2010 after the 22 Bahman rallies marking the 31st anniversary of the founding of the Islamic Republic. They probably think they can trudge through the current uprising using similar tactics. However, by putting the lead opposition figures, Mir Hossein Mousavi and Mehdi Karroubi under house arrest, the regime has upped the ante. In a way they are themselves removing one of the blocks in the way towards the people’s real demands by rendering the reformists and their reforms out of the realm of possibility. One thing remains certain. This is far from over. The people have become emboldened by recent events in the region (Tunisia and Egypt), and by what they have seen happen since 25 Bahman (February 14) in Iran. When a regime is a repressive as the one in Iran, where the people are seen essentially as slaves that should be subservient to the rule of a God-king, where the minions of the God-king are willing to fight tooth and nail to hold onto their power, the act of opening up a space for protest inspires tremendous hope. To those who think Iranians will not be able to shed this regime, I remind you that the U.S.S.R. fell. Think about it. When we see the will of the Iranian people being expressed against such odds, and in the face of such abject terror, we know that this backwards, terrorist Islamist regime will fade too. Persian Banoo reports that Tehran University School of Science student, Sohrab Jafari, was arrested around Valiasr Square today. She also reports that Tehran University Law student Habib Farahzadi (banned from education by the regime) was arrested today. In the last 32 years, any individual who displayed any loyalty to the people of Iran above the Islamic Republic has been eliminated. Anyone who could have been a sincere leader of the people – a person who valued inherent rights, a person whose religion did not supersede the people’s needs – that person was not allowed to live. So there remains no one powerful but those from the regime. The Green Leaders know this very well. But what they don’t know – and the reason they shuffled into the background when they didn’t get the power they wanted – is that in this Internet age, in this age when Iranians are some of the most educated and knowledgeable people in the world, they do not need a leader to change their country. They are doing it themselves in the streets. Listen to them this year as compared with 2009 – they are no longer merely denouncing Ahmadinejad – they are denouncing the system itself. They have been shouting “down with the system”, “down with the velayat-e faqih”. Iranians have for millennia been of different tribes, religions and ethnicities but they have always survived as a nation. They do not want this ‘velayat-e faqih’ system – rulership of the supreme Islamic cleric, to put it simply – which is the foundation of power of the Islamic Republic establishment and the Green Leaders. The number of demonstrators was about the same as Feb 14, but scattered across two axes instead of one (which was the case with Feb 14). Violence by the security forces was significantly lower than Feb 14, although their numbers were much much more (the whole city was virtually turned into a military fort). Demonstrators were mostly walking in silence, except when attacked by the security forces. The length of Enghelab Avenue was filled with tens of thousands of protesters. Valiasr Square was the site of clashes. So was Haft-e Tir. One person is rumored to have been killed there. Other than central Tehran, heavy security presence — including special anti-riot NAJA police, Basijis, and vigilantes — were seen by this writer in western Tehran (Shahr Ara) and northern Tehran (Tajrish). I was told by several people that Tehran Pars and Imam Hossein Square in the western parts of the city were likewise inundated with various security forces. Many of the security personnel wore masks to conceal their identities, as was also true on Monday. In last year’s protests, only a handful of these men wore masks. Today, most of the Basij and Intelliegence Ministry personnel did so. Even some of the regular NAJA cops, whom many people regard as civil servants with batons, were wearing masks. Some Basijis were wearing ski masks that gave them a seriocomic look, especially when they were seen eating snacks with their masks on. I walked from Vali Asr Square to Vali Asr Crossing to Enghelab Square towards Azadi Square. People (hundreds of thousands I think) were walking densely in the sidewalks, with smiles on their faces. It seems that the security forces were given specific orders not to engage with the demonstrators unless they start shouting slogans. I saw many many Basijis and anti-riot police and plainclothes and bikes and so on. With the events of Feb 14 protests, people seemed to prefer demonstrating in silence in order to reduce the level of tension and violence. Video of regime thugs cussing at, arresting and beating people. Video claims that the police officer from Niavaran beating passers-by is notorious for beating young people and confiscating their vehicles. Rumors and reports had been circulating for the last couple days that the home of opposition figure, Mir Hossein Mousavi, had been barricaded with metal bars – for all intents and purposes, making his defacto house arrest official. We have multiple reports that ambulance vans were used in today’s protest to arrest people! There are also reports that Faezeh Hashemi, the daughter of former president and current head of the Expediency Council, Hashemi Rafsanjani, was arrested. All indications are that there has been a massive turnout of protesters in Tehran. Also many thousands protesting in other major Iranian cities. Madyar reports that in Mashad’s Rah-namaii, Ghaem and Parastar streets, security forces are beating people. BREAKING: Reports of up 3 people killed, shot to death. We have not independently confirmed – seeking confirmation. Golnaz Esfandiari of RFE/RL, has reported that, Ahmad Maleki, the Iranian diplomat who resigned in Italy is reportedly the nephew of opposition leader Mehdi Karroubi. 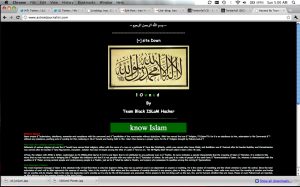 The website of the regime’s leader, Ayatollah Khamenei, has been brought down–most certainly by some form of cyber attack (likely a distributed denial of service attack). Potkin Azarmehr reports that regime thugs are beating people in Vanak Square “with truncheons but ppl not running away, fighting back”. Saham News (news site close to opposition figure effectively under house arrest, Mehdi Karroubi) reports that crowds are growing in Eghelab Square in Esfahan. Reports of heavy clashes near state broadcasting, IRIB. Tear gas used by riot police. Eye-witness tells BBC that gunshots heard near Abbasabad. We have confirmed protests in Tehran, Shiraz, Esfahan, Mahabad, Mashad, and Tabriz. Scattered clashes between Vanak Square and Valiasr Square. People being arrested. Reports of people being beaten by security forces and plain-clothed thugs. Madyar reports clashes in Molla Sadra Street in Shiraz between people and security forces. He also reports that in Mashhad’s Rah-namaii Street security forces outnumber protesters by as much as 10 times. Again, urging caution with these reports but we are getting reports of protests in multiple cities now, including Shiraz, Esfahan, Tehran, Tabriz, Mashad, Gilan, and Qom. Multiple reports that Keshavarz street in Tehran is in control of protesters. Reza Sayah of CNN reports clashes at Gharib and Enghelab Avenue, with 4 people arrested. Chants of “Death to dictator” can be heard in that location. Also clashes with security forces near Eghelab Square with at least 15 people beaten by the security forces. Unconfirmed report of clashes at Amir Abad. Main squares in Shahrake Gharb and Saadatabad area are full of security guards. Clashes reported between plain-clothed regime vigilantes and people at Enghelab Square. Mahabad protests in Kurdistan, reported very large, with Kurdistan protesters siding with Green Movement. Unconfirmed: Guards totally lost it in Amirabad have started shooting at people. Main squares are controlled by anti-riot security forces. Basijis control side streets. Rahezabz confirms that crowds gathered in front of IRIB in Valiasr Street, chanting “Allah-o-akbar”. BBC Persian reports that tear gas has been fired at Valiasr. Reports of “special security guards” and Basij guarding the entrance to state TV, IRIB. Reports of heavy security presence around Gisha bridge in Tehran. Unconfirmed reports of people chanting in front of state TV station, IRIB. Here is a statement and photo of Ahmad Maleki, who just resigned from the Iranian Consulate in Milan. 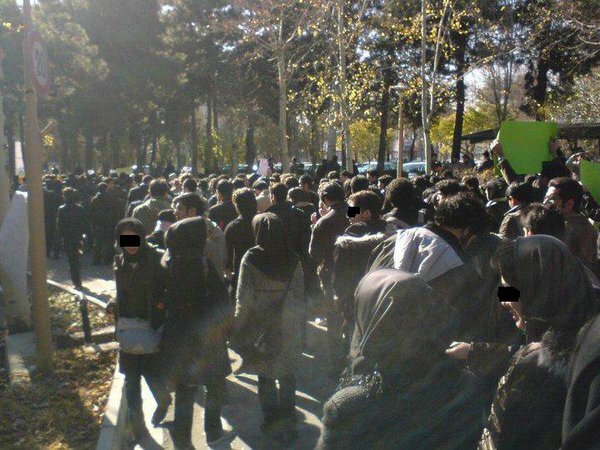 BREAKING: Multiple reports of crowds moving towards Iranian state TV building for Seda va Sima (Voice and Visage). Also several reports of protest building in various locations, including Haft-Tir Square and Eghelab Avenue. A top diplomat at the Iranian Consulate in Milan, Ahmad Maleki, has resigned in solidarity with the opposition. Peyke Iran reports that Mehdi Karroubi has written the head of Iran’s Judiciary, Sadegh Larijani, saying he stands with the people till the end. In a somewhat shocking bit of news, regime stalwart, and Speaker of Parliament, Ali Larijani, opines that house arrests of opposition figures and the use of force against people will “lead to nothing”. This is very significant for a number of reason. 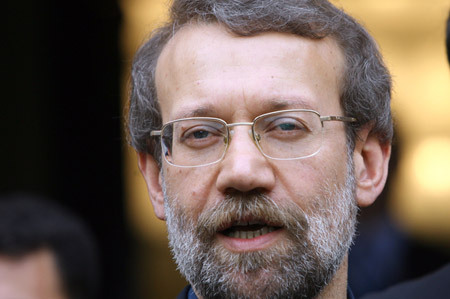 Larijani is considered to be close to the Supreme Leader, so his comment indicates that he must be somewhat distressed at the direction that things are heading, otherwise he would likely not stick his neck out in this manner. We have an unconfirmed report that crowds have formed Valiasr and Sohrevardi Streets. CNN’s Reza Sayah tweets of an eye-witness report from Tehran of thousands of security forces patrolling the major squares and intersections of Tehran. The Internet is at a crawl. No protests so far. A couple days ago the Telegraph published an article claiming that they had a copy of a letter that was, according to them, widely distributed within the ranks of the Revolutionary Guards, indicating that some of the commanders of the Guards had reservations about firing upon protesters. We felt that this was highly suspect, and still do. We have not seen the letter, nor is there another source to confirm it. Just a few hours ago, it came to our attention that a report was posted on a Revolutionary Guard website, of a speech by Hassan Firouzabadi, the head of Iran’s armed forces, in which he addressed the Arab world, urging them to learn from what happened in Tunisia and Egypt and to side with their people. The message is significant, considering that Iran is experiencing its own spate of uprisings and protests. Could Firouzabadi be sending a coded but not so subtle message to the regime, warning of the folly of ignoring the demands of the people at home? With rumors of fissures within the regime’s armed forces, we can’t help but wonder how this will all pan out. Back from an extended break, we are starting the our live-blog for the day of 1 Esfand, (February 20, 2011). A call has been made for nationwide protests today by the opposition movement in Iran, six days after the tens of thousands to hundreds of thousands of people showed up in the streets in solidarity with the freedom movements in Egypt and Tunisia, on 25 Bahman (Feb 14, 2011). We know of two people that were killed, Saneh Jaleh, and Mohammad Mokhti, during the protests. Today’s protests have been called to commemorate them. We are just now connecting with our network and will post updates as we get them. Stay tuned. We need to see the crowd win here and there… examples of people power overcoming regime goons to give encouragement. Maybe some chants about how Islam does not support violence against one another and so on to get into the heads of regime supporters about how things are so wrong in Iran. Personally, I’d like to see instruments of regimes power, vehicles bringing in goons, propaganda outlets, etc, peacefully (without loss of life) disabled or destroyed. Great information. I’ve bookmarked this website. Congratulations on the great work!! Amazing. 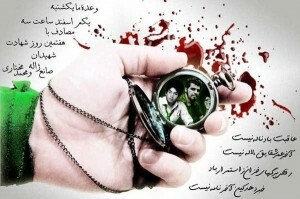 Freedom for Iran!!! This website is excellent. Even though I feel embarrassed that i am watching from afar and not participating in the front line of freedom fighting with my brothers and sisters, I now feel i can keep up to date with moment to moment events in Iran. Keeping up to date with one website was difficult to do for those of us who have grown up outside of the country and unfortunately not as confident with the Persian language. It is also excellent for foreigners to keep up with Iranian news. Please keep this us – we need an international voice to promote awareness and change for our people. 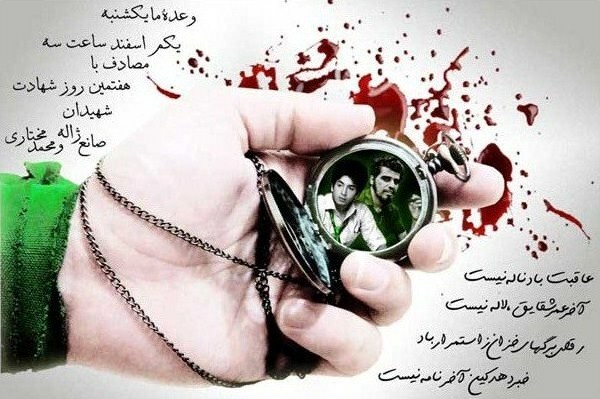 Payende bad iran and all of its patriots – for throughout history we have never tolerated dictators or unwanted foreigners ruling our cournty and are willing to die for our race and homeland. Things will change, i am more than hopeful. Definitely excited i elected to visit the backlink i saw for this blog post in msn. THANK YOU for all you do!! I began learning more about Iran, this regime, and most importantly, the people, when just a few days after the election in ’09, I was asked to help establish proxies because of the Internet blackouts. While I can’t do as much as I could back then because of my health; the courage & determination of the people has inspired me to not only help in any way I can, but more importantly, to educate people as to the TRUTH of what is going on in Iran. I find it frightening that SO many in this Country have the attitudes they do-not only of the wonderful people in the Mid-East, but it seems more & more of young people; and it extends globally. I think it threatens them in some ways that the WE Generation shows so much courage, a sense of consciousness & awakening that so many in my generation & older seem to lack. As the VERY Proud Mom of three such precious gems, I can say that seeing my kids with their open-mindedness, generosity, compassion, acceptance & sense of responsibility to the good of ALL of this World; has imbued me with a sense of Hope for the future. My Son, a full-time student, majoring in Anthropology & PoliSci, working 2 jobs, and plans to spend this Summer working for a global human rights organization-has spent the past 3 weeks “behind the scenes”; is my Hero. He’s even signed up to take Persian as a “special course” he talked a professor into giving-so he can communicate better with his new Egyptian & Iranian friends. While the people in Iran have a long hard road ahead of them, they need to know they have a LOT of support. We ALL need to be working towards a better, freer, more tolerant & compassionate world-especially in these days of uncertainty & fear of the future. PS George Soros was on MSNBC-and yes, that WAS a GREAT interview!! He’s a wise man.